Energy storage is an essential component of an electricity economy based on renewable energy; the possibilities for energy generation do not match consumer demand. Technology based on flow batteries is one potential solution to such energy storage because they have a very high energy efficiency. 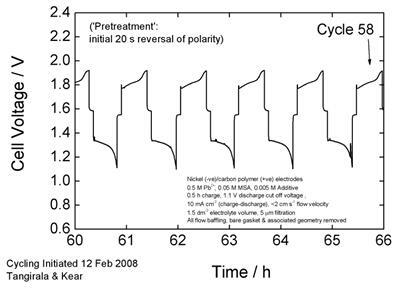 In Southampton, the programme centres on the soluble lead flow battery, Click on the image to see the electrode reactions. And the electrolyte is methanesulfonic acid. Compared to other flow batteries, the advantage is that a separator is unnecessary and there is only one electrolyte flow. 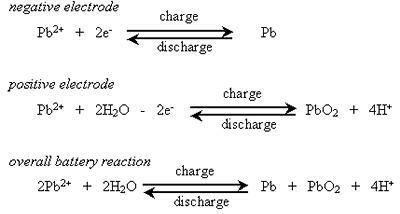 The electrode reactions are possible at high rates. The challenge is now to control the deposition of the lead and lead dioxide at all the rates and in all the conditions met in an operating energy storage system. During the dti funded programme, 10 cm x 10 cm have been cycled > 100 times without loss in energy efficiency and work is moving towards larger and bipolar cell stacks.